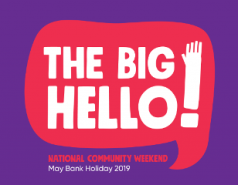 Ireland’s first National Community Weekend is taking place over the May bank holiday weekend (4-6 May), and community and voluntary groups are invited to get involved by hosting local events. Small grants and information packs are available from your Local Authority (contact your local authority for more information). There are many ways to engage: Celebrate the beginning of summer by organising your very own Street Feast. There’s no better way to meet people in your local community, make new friends and build a more welcoming community than sharing food over the ﬁrst BBQ of the year. Most of all, it’s a great excuse to either reintroduce yourselves, catch-up, eat good food and have a bit of fun! Contact your Local Authority to apply for a small grant or to order an information pack.